Mrs. Sudie Knight send in another interesting story of pioneer life in South Floida, based on an interview with a highly esteemed old lady who was born in Hillsborough County and who passed on to her home in Heavan but a few months ago. 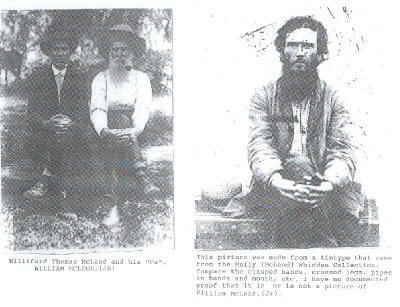 In Mrs. Molly McLeod Whidden's own words, Mrs. Knight presents a realistic recollection of frontier life. "My father was Wfiliam McLeod and his father was born in Scotland. Grandfather McLeod married Emily Sloane, and all their children were born in this country—though not In Florida. In Georgia, I think. They had four girls and four boys. Father married Susan Howard, a widow with two daughters, Virginia and Missouri. Her parents were Seth Howard and Harriet Weeks. "Father and mother were married in Tampa. They had 10 children, three boys and seven girls. I was the oldest. We were always happy at home. We loved each other and we were brought up right and did not see other people enough to learn anything bad. We didn’t have many neighbors, and most of them were good people. "Mother was converted when she was a girl. Father was converted during the Civil War and baptized at night. I do not know why It was at night, unless it was because they did not have time for church in the daytime. "He was usually cheerful, but when he did get mad he really got his Scotch up. 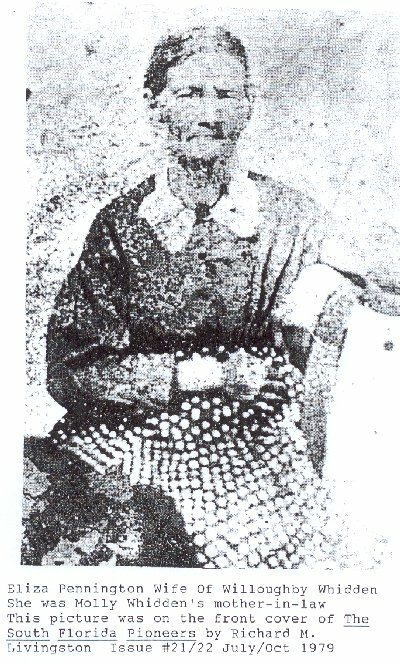 His mother died of smallpox during the war while he was gone, and was buried by Grandfather and a colored man. Neighbors were afraid to come to help them. "FATHER FOUGHT through the Civil War. He was never wounded, although he fought in the battles of Chickamauga and several others I don’t remember. He almost froze one time when he was barefooted and it snowed. He caught a cold, and couldn’t speak above a whIsper for three years. "His captain was named Josh Riggs. He used to come and stay all night and he and Pa would sit up till alter midnight talking about the war. We children loved to sit up and listen. "He fought in an Indian war, too, and my father-in-law Whidden was killed in a battle with the Indians at Payne’s Creek. "OUR HOME WAS about four miles from where the New Zion Church now stands. Most of. our children were born there and Pa and Ma died there. "All of us children learned to work as soon as we were old enough. Ma made all of our clothes. We’ raised the cotton and bought the wool. Pa did the carding till we older ones got to where we could do it He would card the rolls at night after working In the field all day, and Ma would sit up and spin and weave. "As soon as we could all of us girls learned to spin and weave and that kind of work and remember she used copperas In making yellow. The first sewing machine I ever saw was a little thing that sat on a table and turned with a handle. You had to crank with one hand and hold the sewing with the other. It didn’t sew very fast. "The first calico dress I remember was bought from a peddler. He had one piece of calico with blue and white stripes about two fingers in width with red roses in the white stripe. My two half-sisters got dresses off that piece. Mine was pink with fine white pin stripes and white flowers in it. "We wore home-woven dresses for everyday. We went barefooted all Winter around home and saved our shoes for Sunday to wear to church. We had church.then under a brush arbor. "MA COOKED in the fireplace and used a.long iron rod to hang pots on, called a crane. We didn’t can anything. I never saw a glass jar for canning until alter I was married. But we dried a lot of things. We dried green beans, corn and pumpkins. We had to soak them before cooking. "Most every family had a cook scafold to use in the Summer, when it was too hot to have a fire in the house. The men folks built a stout table about waist high and put boxing around it. Then they filled this box with sand. They made it large enough that when we built a fire in it the wood planks would not catch on fire. "There were no orange groves in this part of the country then. There were a few orange trees In Tampa, and Grandpa Howard had one in his yard. My father bought two and set them out on our place and. soon we had oranges of our own. Sour oranges and lemons grew wild In some of the hammocks. Grapefruits got scattered through the country while I was growing up, but I never knew of a pineapple in this region until several years after I married. "WE DOCTORED with home remedies, and one of them was Jerusalem Oak. it was a weed that made an awful bitter tea, and all of us children hated to take It. But all the same they gave us a lot of it. "One day Naaman. my oldest brother, and I thought of a way to keep from taking the tea. We took Pa’s hatchet and went all around the yard. and in all the fence corners and chopped down every Jerusalem Oak on the place. "Almost everything we had cooked the juice till it was ready to go to sugar and then would have holes bored In the bottom of the barrels and let the syrup drip into a pan. He stood up stalks of sugar cane in the barrels so he could stir the sugar every few days to keep the crust broken so it would dry out and drip better. When it got dry and crumbly he would take it out and stack it in another barrel and it was ready for use. "PA ALWAYS raised enough rice to do us. He built a tight little room to put the rice in after it was threshed out and cleaned. "I remember one Spring there was a late frost, in April I think It was, and everybody’s gardens and truck patches were killed. Many families were already about out of what they had saved over to run till Spring, and some people were absolutely without anything at all and moved away. We still had plenty of rice and we had cabbage. "That is what we lived on until Pa could put out another garden and it grew up. We would eat rice one day and cabbage the next till one time Ma said ‘Let’s try a cabbage and rice pilau.’ So she made it and we all liked it, but we sure did get tired of cabbage and rice. Pa gave lots of it away. "We generally had plenty of meat. There were lots of deer in the woods in those days and a lot of venison was wasted. Deer hams could be sold in Tampa, and some men would cut out the hams and leave the rest of the deer wherever they had killed It. But Pa never did that. He sold hams In Tampa to buy our shoes and other things, but he always brought the deer home, and if we didn’t eat it at the time we would dry it. "We dried turkey breasts, too. If we had two or three turkeys at a time Ma would cut off the breast meat, salt it down and then after it had taken salt would string them up and hang them in the sun to dry. When it was sliced and fried It was fine. Of course we had plenty. There were not any free schools in those days. The neighbors who lived close together would join in and hire a teacher. My first teacher was an old man named Davis. He taught school in my ‘Grand. father Howard’s barn. The men made benches and put them along the sides of the wall, they were split logs smoothed with a plane with wooden legs pegged into them. We didn’t have any black beards nor any slates. A few had pencils and paper, but paper was scarce. When.a child got a sheet of writing paper he thought he had something wonderful. At my second school the big boys and girls had slates. We little ones had the Blue Backed Speller. It had reading in It, and that is all we had to study out of. I went with my two elder half-sisters, and besides us there were my grandfather’s three boys and two girls, the Roberts children, Lizzie Tucker, two Hendry girls and a boy of the name of Dan Pate. Yes, there was an Arnoa girl, too. My next school was taught by a young man named Buddie Payne. The schoolhouse was in a harnmock this side of where the New Zion Church is now. I’d not learn much from him, for be put in all his time with the big boys and girls. We little ones had only one lesson a day. "My third school was taught by Miss Lizzie Berry, It was called the Taylor school and was five miles from home. My two half-sisters, my little brother Naaman and I went from our house. The other childreni were the Taylors, Knights, Wingates, Stevens, Harrises and Pitts, I studied the Blue sacked Speller and a reader. I had a pencil and paper. I don’t remember any blackboard in this school. "WE CARRIED OUR dinner in tin buckets—if we could get the buckets, Some of us had to use homemade baskets that some of the family had made out of strips of inner bark of certain trees. "They were all right, but everybody had baskets of this kind of all sizes from little to big, while tin buckets had to be bought at the store. and that made us feel like they were more valuable. "Our dinner usually consisted of corn bread, rice, and meat of some kind. Sometimes we had biscuits, but flour wasn’t as plentiful as corn was. We didn’t always have flour, but we always had corn meal, grits, and rice. One of the best things we had was sweet potato pone. It was made of grated sweet potatoes, eggs and spice and sweetened with some of our homemade sugar. "We had to walk five miles to Miss Berry’s school. We took a path through the woods and we often saw wolves. Sometimes mother would carry Naaman part of the way on her back. She would talk and laugh with us and tell us stories, and we loved for her to go home with us to stay all night. Then, of course, we would have her to go along with us back to school the next morning. "AT RECESS WE played ball and Three Old Cats. Sometimes the boys played Bull Pen. Boys and girls did not play together. We girls played such games as Dare Base, Poison Stick and Wood Tag. I was almost grown before we learned to play Handkerchief and Go In and Out the Windows. Singing games like Skip to Ma Lou came in at about this same time. "We had recitations on Friday afternoons. Some of the neighbors would come in to hear us and most all, of us learned little pieces to recite. We would sing songs, too. We never had a Christmas tree at school nor at home either, but we always hung up our stockings. Sometimes we would get a little toy made out of wood, but we never got any china dolls. Our dolls were all homemade. We always got candy and sometimes an apple. "We never had parties. I didn’t know what parties were. If we had anything like that we would all get together and go to the creek to fish and have a fish dinner. Of course we went to church and had church dinners on Sunday. We generally would camp out on Christmas night and next morning kill deer or wild turkeys to cook for our dinner. Times have changed a lot since then." Aunt Molly died last June 28th In the Palmetto Clinic at Wauchula and is buried In the New Zion Cemetery, between ,Wauchula and Myakka City.